I think my father did it. He bought his first Jeep after the war. He always told us the story about the first time he saw one. It was when the Americans came to the Mosel area after the tough battles from D-day down south via Belgium and the German mountain region in the west. My father was about 12 years old, standing in front of my grandmothers house while the Model MB Jeeps were passing when he said the historic sentence, that one day he will own one of these. He bought one in 1950 from the US Surplus and he bought a trailer as well. I was born in 1956 and a long time before I was thinking about my first girlfriend I was thinking to get a Jeep as well. My father sold his to his company to haul a logging horse to the forest and back and he bought a "Nortrack Stier" , a traktor based on Jeep frame and axles. I bought my first Ford GPW from the Austrian Army after they had taken over a lot of war stuff from the US Military after the war. I was the first kid in my area that painted the Jeep red and kind of civilized or CJ'd it. I did not join the forces and I didn't like to drive around in the olive drab color. I put "fancy" wheels on it which an American friend ordered at Sears for me and I changed the engine to a 160 HP engine from a Volvo Amazon. Great car that had a very good gas mileage and spare power. After this, we as a family (my father owned a M38A1 in the meanwhile) infected about 15 other guys and girls with the "Jeep Virus" in our small town and we had enough Jeeps in the area to be a Jeep Club. We went out every Sunday or Saturday after a whole day repairing and changing the rigs. more. 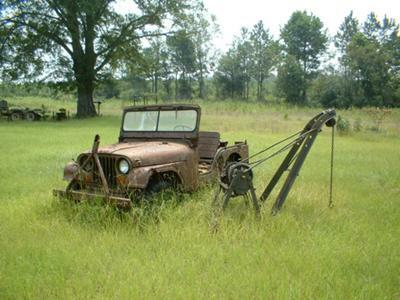 I bought a Diesel Jeep from Australia (you know, down under with the kangaroos) and another CJ2A in Oregon by ebay. I worked already in many countries around the world and the best thing that ever happened to me was that I, because of my hobby and interest in the Jeep, met so many people from the scene. In the Philippines, Thailand, Australia, all over Europe and of course in the Americas from Venezuela, where we gut stuck at night going home from a bar in a CJ5 with 5 guys in a Monsoon rain in the rain forest, or in Mexico where I lived for two years and where I still join the Club Tepo 4x4. Last but not least in the US and Canada, where I know from George the Jeep in Seattle, to Florida so many Jeep people that it would be too much to name them all. I went to swap meets and to the SEMA show and on to thousands of junk yards in America, to Moab a lot of times and finally, for my 30th Jeep year anniversary, to the Rubicon Trail. I can say that this car was and still is part of my life and it was and is for my family. My brother owns a CJ7 and a Cherokee and had one CJ5 in the States because he works there a lot. My other brother had a CJ7 as well and he is a little off the track while at least he is thinking about a TJ a lot. Yeah, if this doesn't explain why, I can write more about the Jeep Models all over the place in my house or about how to buy a Jeep in Oregon by eBay and bring it to Germany or ............ but I have to get going to the workshop. The coil spring conversion and the trailer restoration is waiting to be finished. Larry's Comment: You definitely are a true "Jeep Lover" Karl. Thanks so much for giving us some of your Jeep history.